One house, two mice, three cookies . . . and the adventure begins. In gorgeously illustrated spreads and two-word phrases, this picture book takes two mice through their exciting and eventful day. Funny, lively, and easy to follow, the book offers the youngest readers the chance to count from one to three and back again. Sergio Ruzzier's illustrations display his signature quirky, colorful, and slightly surreal view of characters and settings, and the text is a minimalist gem. It's a perfect book to share one-on-one with a young child and a lovely lead-up to bedtime. Sergio Ruzzier has illustrated a number of picture books, some of which he also wrote. Italian by birth, he lives in Brooklyn. Visit him at http://www.ruzzier.com/. * "The simplicity of the text means that the earliest readers will soon be able to pick it up and will return to it over and over. One story. Two mice. Three cheers. Lots to love." "The small dimensions of the book (not to mention its heores), the reassuring patterns of Ruzzier's text, and the surrealist edge common to his artwork create an adventure with a scintillating combination of danger and comfort." * "Using only two-word phrases and a sample repeating number pattern, this clever book creates a fast-pacede adventure for listeners and new readers alike." 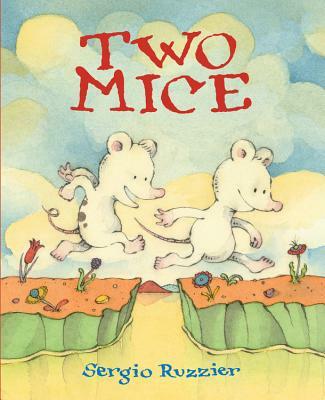 "The inventively undulating narrative structure, the sherbet-like color palette, fantastic tile floors, countless tiny visual surprises--and last but not least, the comfortingly resilient mouse friendship--make Two Mice a standout."